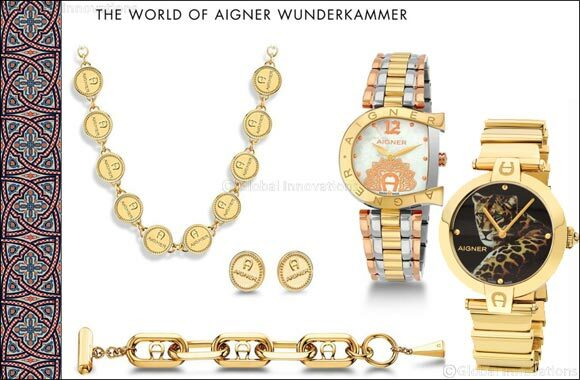 The AIGNER Wunderkammer is an exclusive collection of rarities— an amalgamation of phenomenal thoughts juxtaposed by superior artistry. Each piece from the AIGNER treasury is exceptional – reimagined for the modern times yet holding true to their magic. An expressively detailed accessory from the collection that recently walked the runways of the AIGNER Milan fashion show is the limited edition link bracelet. Structural and refined with a deft silhouette, the beautiful bracelet is accentuated by metallic links that encompass elegant AIGNER ‘A’ logos and has an avant-garde T-bar fastening. The bracelet – available in a limited number of 50 pieces each – comes in gold and rhodium plating. It has a special numerical engraving on the T-bar closure, revealing its serial number from 01 to 50. The ‘A’ logos between the links, the numeric engraving on the T-bar closure, and the special Wunderkammer packaging are all salient details that adorn this one-of-a-kind, limited edition wrist jewellery. A gem that came out of the AIGNER treasure trove, the coin jewellery has enough chutzpah to make it the season’s most coveted piece. The aesthetics of the collection is a continuation of AIGNER’s Wunderkammer theme, where the coin motif is a literal representation of the collection’s inspiration—curiosities and mystical treasures from distant lands. The extravagant choker, earrings and bracelet set is a delightful creation that is enhanced by the unmissable presence of AIGNER engraved on the coins. The remarkable attention to details is beautifully demonstrated in the symmetry of the design – where soft lines meet bold silhouettes with unbelievable ease. The collection also features prints and embroideries from distant lands like the ocelot print and the Medina designs—giving an exotic touch and merging cultures from all over the world.